What’s crunchy, golden brown, and perfectly round? Our Cinnamon Sugar Crunchy Cookies! With the right balance of sweetness and dash of cinnamon, you won’t be able to stop at just one. True story! 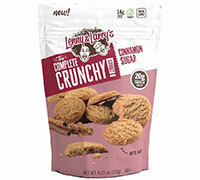 CANE SUGAR, PALM FRUIT OIL, PROTEIN BLEND (VITAL WHEAT GLUTEN, PEA PROTEIN), ENRICHED WHEAT FLOUR (WHEAT FLOUR, NIACIN, REDUCED IRON, THIAMINE MONONITRATE, RIBOFLAVIN, FOLIC ACID), CHICORY ROOT FIBER, NATURAL FLAVOR, CINNAMON, SALT, BAKING SODA.